​​Designer dog breeds are becoming increasingly popular; with all the new adorable breeds out there like the Puggle, Labradoodle, Cockapoo, and, perhaps the cutest of them all, the Horgi. Also known less commonly as the Corgsky or Siborgi, this breed is a wonderful mix of the qualities of the drop-dead gorgeous husky with the overwhelming adorableness of the energetic corgi. 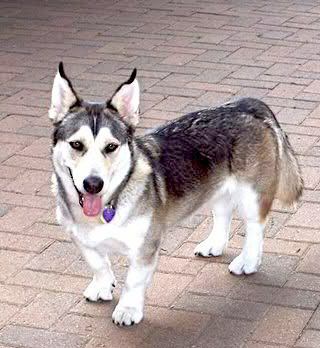 Curious if this Corgi Husky mix is for you? Check out this list of 10 facts. The corgi on its own, like most herding dogs, is an assertive and highly intelligent breed. Combine Corgi with the smart Siberian husky…let’s just say that pretty soon you’ll be asking your dog to help you with your math problems. Also, a little tip for newbie pet owners: horgis are so intelligent that they will learn how to destroy and escape from that fence you erected in the backyard. So cross your t’s and dot your I’s if you don’t want to be putting up ‘dog missing’ posters all over town. Was losing weight or just getting fit in general on your to-do list this year? Are you saving up for that $$$$ treadmill guaranteed to help you burn twice as many calories (as if a treadmill isn’t the most miserable way possible to lose weight)? Just get a Horgi and you’ll never have to worry about a lack of exercise again if you love your dog. Corgi husky mixes are one of the most energetic combinations of dogs out there, so take your furry friend for a couple daily walks or runs in the park. There’s no getting around it, training a Horgi is a monumental and challenging task, not fit for the faint of heart or novice dog owner. Prepare to repeat yourself A LOT while training your dog, not because they are stupid (quite the opposite), but more because of the stubbornness factor. ​​To make training your Horgi as easy as possible, you have to start early. With ​the best dog training system and a caring owner your dog will be very well behaved. A Corgi Husky mix requires extensive grooming, sometimes once or twice a day once shedding season really hits, so this isn’t a great breed for those who suffer from asthma. Besides shedding, they require the standard maintenance: a proper bath with good dog shampoo only when truly dirty, proper nail trimming, and teeth cleaning two or three times a week. Corgis and huskies are genetically conditioned for a highly active lifestyle (think chasing sheep all day and pulling sleds with doggy buddies). Unfortunately, even if you do take them for long walks and play daily, it’s still not the kind of activity they are genetically predisposed towards. Because of that, today’s Corgis and Huskies are more sedentary than their high ancestors, which may lead to a tendency towards obesity. While it’s really hard not to give in to the temptation to spoil them with treats, try to resist. This rides on top of the last one. Besides obesity, they are more predisposed than some breeds towards eye problems, hip issues, epilepsy, and skin diseases. Avoid these unpleasant conditions to the best of your ability by feeding your horgi a high-quality diet, preferably made up of fresh ingredients like chicken liver, sweet potatoes or rice, coconut oil, and other nutrient-dense foods. Avoid the cheap dog food at the store; it’s loaded with unhealthy, digestive-damaging fillers like soy and wheat. If you live in an apartment or a small house, they are a wonderful and more energetic alternative to the more traditional apartment lap dogs. While a Husky would be too large, a Siborgi is just the right size, usually weighing a modest 25-40 pounds and standing a little over a foot tall. ​This beautiful corgi mix has a delightful and loving personality and can be good with kids if trained properly (best avoided around babies and very young children though). Horgis are loyal, affectionate, and confident pets, sure to turn every bad day into a good day. That is, assuming they didn’t escape from that fenced yard you put up.